Be the first to share your favorite memory, photo or story of Jennifer. This memorial page is dedicated for family, friends and future generations to celebrate the life of their loved one. 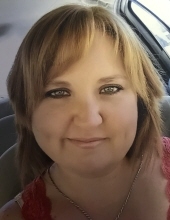 Jennifer Ann Brown, 38, of Breckenridge, Texas passed away from this life on October 30, 2018. Memorial services will be held at Gunsight Baptist Church at 11a.m. on Monday, November 5, 2018 with Charles Kuhn officating. Visitation for family and friends will be Sunday, November 4, 2018 from 2p.m. to 3p.m. at Melton-Kitchens Funeral Home Chapel. Jennifer Ann Brown (“J,” “Jenn”) was born November 14, 1980 in Breckenridge, Texas to Lonnie and Sandy Brown. She graduated from Breckenridge High School and attended Texas State Technical College. Jennifer was a loving, devoted mother of four who enjoyed preparing meals for the family and making every day a fun day. She was a passionate lover of animals. Her pets were like her children, and she served the Abilene SPCA for five years. Jennifer was not just a caregiver, she was a giver of love and compassion to all creatures (human and nonhuman) that she met. Her dimpled smile and fierce sense of humor would light a room. Jennifer’s strength was exemplified when she battled and beat breast cancer with her courageous spirit and tenacious heart. She is survived by her four children, Alex Folsom, M’Kayla Folsom, Zane Brown, and Adara Folsom, all of Breckenridge. Additionally, her mother, Sandra Brown of Breckenridge, her father and step-mother Lonnie and Sheryl Brown of Abilene, sisters April Joy Brown of Wichita Falls, Jamie Brown of Stephenville, brother, Anthony Brown of Abilene, grandmother, Marian Stracener of Breckenridge, uncle, Ricky Stracener of Breckenridge, and countless friends far and wide. She was preceded in death by her grandfather, James “Osmo” Stracener of Breckenridge. The family has requested that memorial donations be made to the Sandy Brown Special Fund established by Breckenridge Interbank, or can be left at the funeral home office. Floral donations may be arranged through Melton-Kitchens Funeral Home or The Bouquet and Co. Donations can be left at funeral home office in memory of Jennifer Ann Brown. "Email Address" would like to share the life celebration of Jennifer Ann Brown. Click on the "link" to go to share a favorite memory or leave a condolence message for the family.